Prevents Termite Damage Before it Starts! Once the termite bait stations are in place, simply check the units once a month to monitor termite activity. The Peliton monitor / bait station detects termites underground where they live before serious and expensive structural damage occurs. Our termite monitors are environmentally friendly, and safe for use around children and pets. The termite detection units contains NO PESTICIDES. Sold and shipped directly from the manufacturer. The tube is the heart of our termite prevention system. It is made from durable Polypropylene plastic to ensure many years of service and can be moved from one location to another. 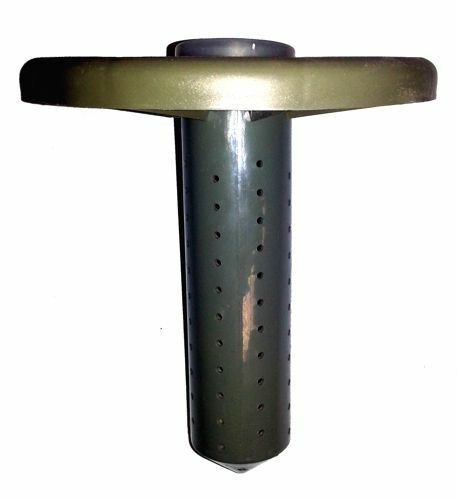 The device contains perforations which allows for easy access of subterranean pest. Bait tube consist of Tube, Wood Bait and Cap. The termite detector locator Disc (sold separately), lies flat on the surface of the ground permitting your termite monitoring stations to be easily located. Since the disc lays flat, they are not a trip hazard and permit easy and safe mowing over them. Our disc are made from UV resistant Polypropylene and will last for years in direct sunlight. An important part of our termite bait station system is the wood bait. The termite bait is specially selected from woods known to attract termites. The bait is inserted into the tube and remains underground beckoning pest to enter the tube. The wood bait should be inspected monthly and replaced periodically to maintain the device's capability. The plastic caps are designed to fit snugly on the top of the tubes, permitting easy access to inspect and replace the wood bait. They also keep out surface pest and excessive moisture.